Why can’t I have Mr. Darcy in my lake? How I wish I lived in the UK and happened upon the 12-foot-tall statute of Mr. Darcy in a wet shirt rising out of the Serpentine in Hyde park. He is advertising for a rebroadcast of the 1995 BBC mini-series and will be moved around to different lakes. Anyone in the UK see this in person? 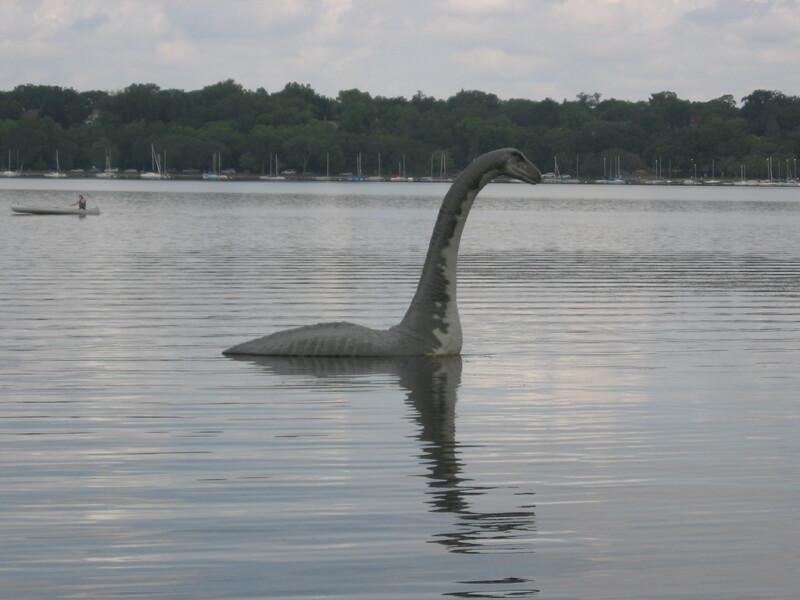 He’s much better than the lake monster that moved around Minneapolis lakes a few years ago. Summer is making me a lazy blogger. Forgive the short post. Tomorrow, something totally off topic: new kitchen countertops being installed! Woo! Wasn’t Darcy scary enough as a normal sized man? Iliana, wouldn’t it be really something? Ana, if you find it, be sure to take pictures! Oh but what a short post … fascinating that they feel they have to promote a rescreening. It was rescreened again here a year or so ago, and even though we have the DVD, and have seen it several times, somehow we had to watch the rescreening. It makes me mad that Jennifer Ehle never got enough credit for her role as Elizabeth. She was such a great one. (Tomorrow I’m lunching with a fellow who’s a good friend of Australian film director Bruce Beresfod. I’ll never forget him telling me how excited Bruce was to get Jennifer Ehle for his film Paradise Road which was made a little after P&P. He thought she was gorgeous and rightly so, I say!) There, I think my comment is longer than your post! I hope so too … our host is a great reader too (as is his wife) … so I’m not at all concerned about conversation. A long lunch on a wintry Friday will be perfect I think. Who’d want a 12 ft. Darcy in the middle of a lake? We want the real man! Arti, LOL, yes the real man wold be better, wouldn’t it? I agree, the whole cast was marvelous, not a weak performance among them. Now wouldn’t that be fun to come across. We have neither a Mr Darcy or a lake monster! There used to be a cool sculpture floating in a pond downtown that looked a little like a skeleton–it sounds weird, but it was actually really cool–alas it’s not there anymore and the pond has been drained for cleaning! Danielle, your sculpture sounds interesting. Maybe after the pond gets cleaned it will come back? I don’t know where the lake monster has gone, if it has settled for good in one lake or if it continues to move around. Mr. Darcy in the would be highly amusing though!